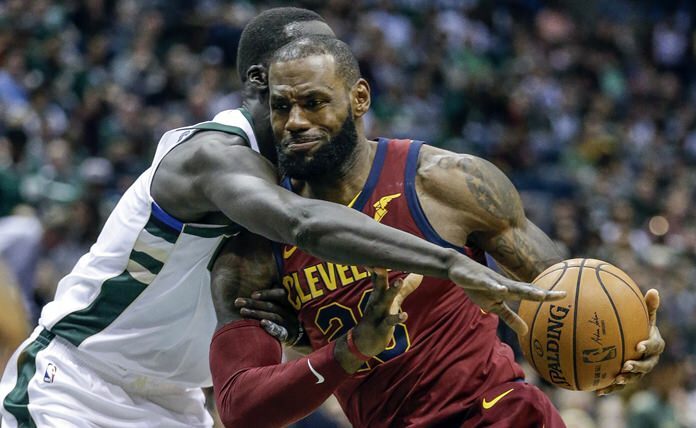 Milwaukee (AP) — LeBron James had 24 points and eight assists, Kyle Korver hit three straight 3s in a big third-quarter run and the Cleveland Cavaliers beat the Milwaukee Bucks 116-97 on Friday night. Milwaukee’s Giannis Antetopounmpo had 34 points on 15-of-22 shooting, along with eight rebounds and eight assists. Malcolm Brogdon had 16 points. Philadelphia — Kyrie Irving scored 21 points, Al Horford had 15 and Boston won for the first time since losing Gordon Hayward, topping Philadelphia. New York — D’Angelo Russell, Trevor Booker and DeMarre Carroll all scored 17 points and Brooklyn beat Orlando in its home opener. Charlotte, N.C. — Kemba Walker scored 26 points, Dwight Howard had 20 points and 15 rebounds in his first home game with Charlotte, and the Hornets rallied to beat Atlanta. Indianapolis — CJ McCollum scored 28 points on 12-of-18 shooting to lead Portland past Indiana. Washington — John Wall scored 20 of his 27 points in the second half and added 10 assists to help Washington beat Detroit.